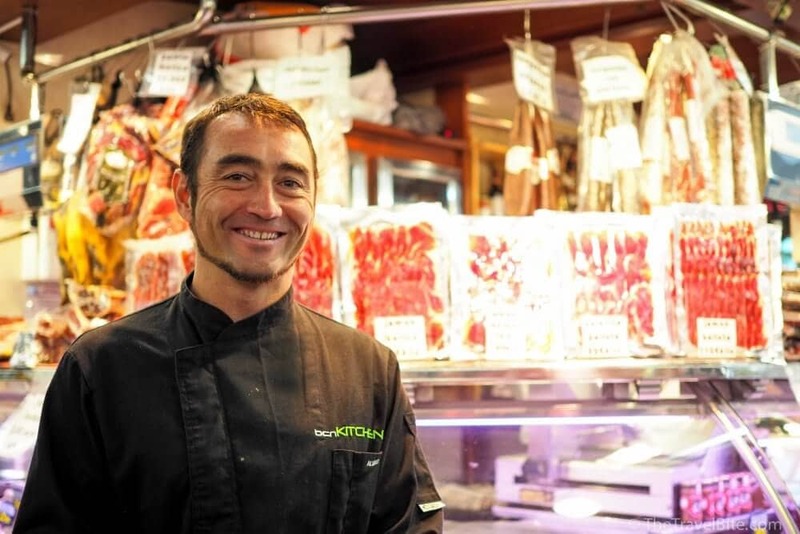 Pete and I recently went on a culinary trip to Spain while working with Go Ahead Tours. 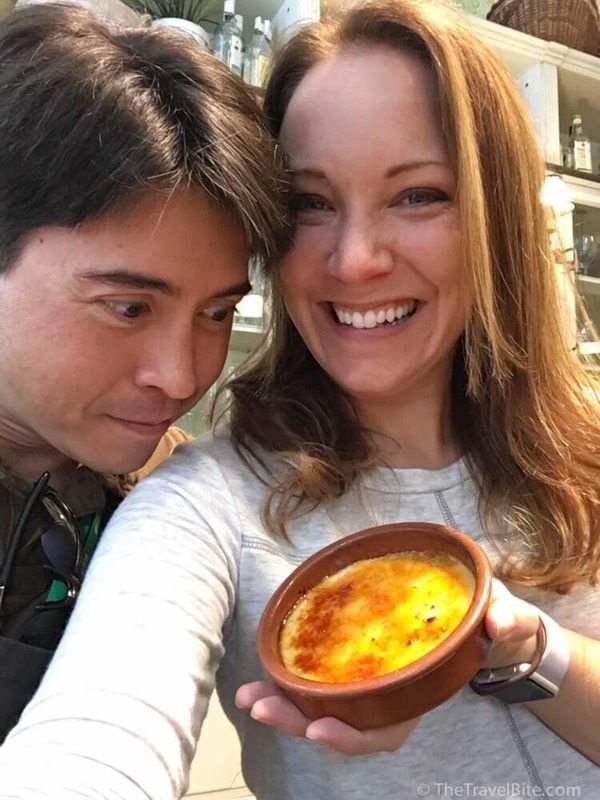 It was Pete’s first visit to Spain, and my second as I’ve visited the Costa Brava region on a previous food-focused trip. 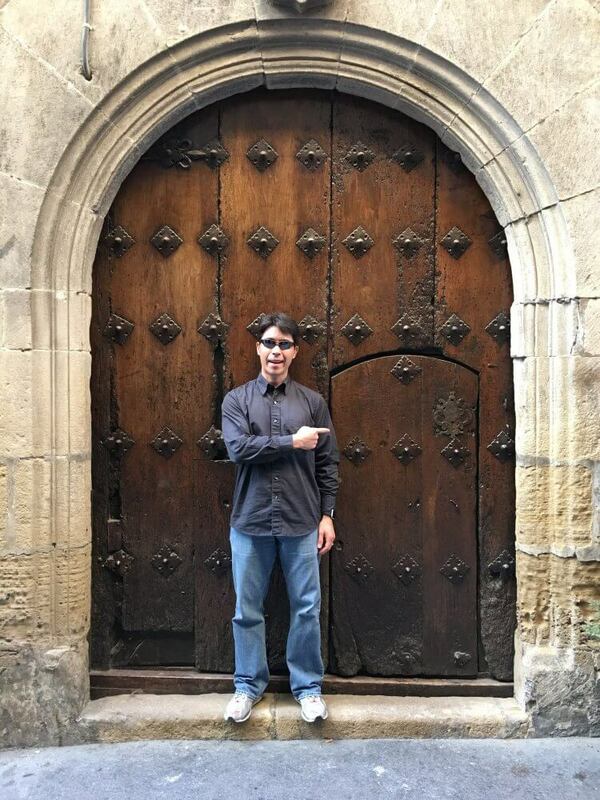 Our itinerary went from Barcelona to San Sebastian, and back down to Madrid, so I was really excited to see the Basque region as it’s an area I haven’t explored before. 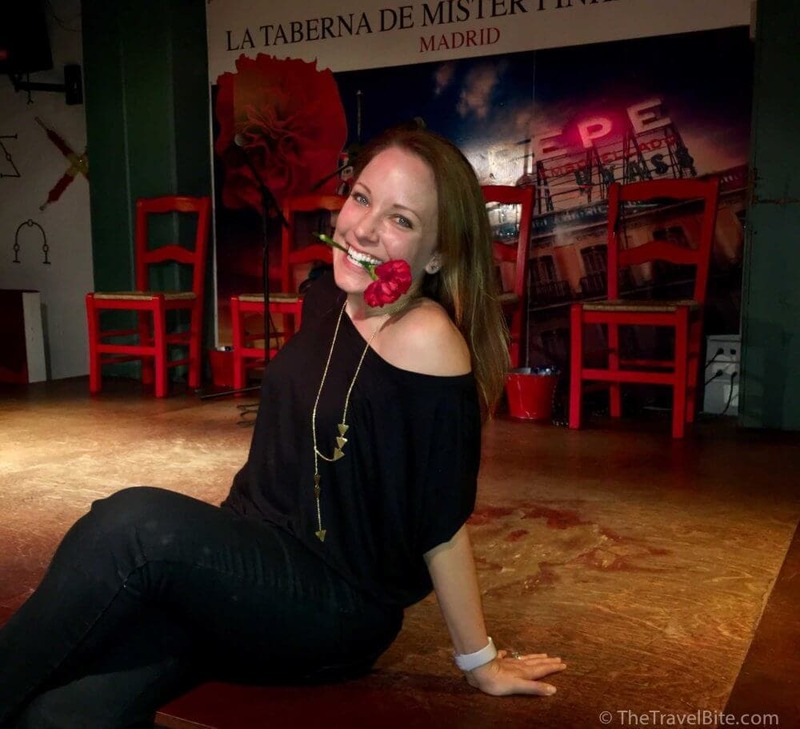 Check out the highlights of our taste of Spain tour below! Want some theme music while you’re thumbing through pictures? I highly recommend George Ezra’s Barcelona. It was in my head the whole time we were on this trip. I’m susceptible to tune worms like that. Go Ahead Tours made it easy to see so much in just one trip, and I’m not sure if we’d have made the drive up to San Sebastian or seen as much as we did had we gone on our own. As for foods, there were plenty new ones (and wines too!) that we tried. But the ultimate oh-my-god-I’m-in-Spain moment had to be the intimate Flamenco performance in a small club in Madrid — the perfect ending to our tour. 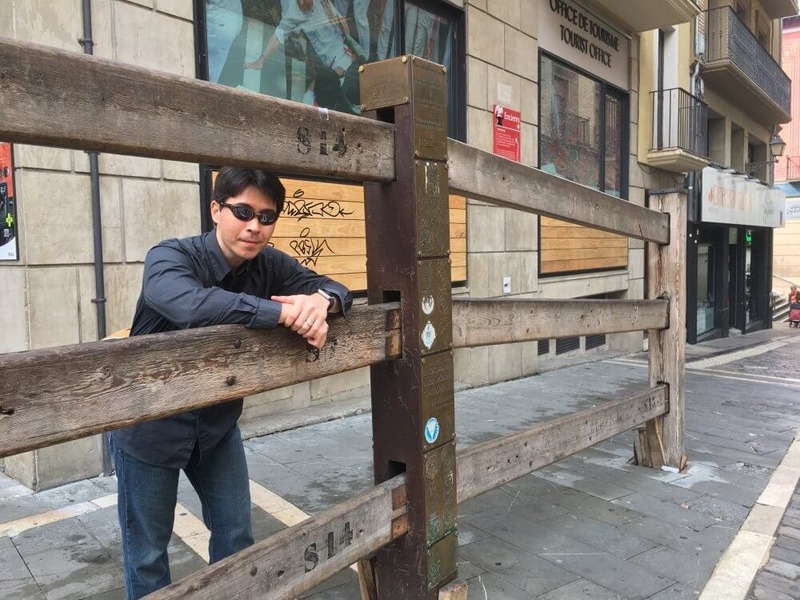 Upon arriving in Barcelona, we couldn’t wait to go for a walk and stretch our legs after an overnight flight. 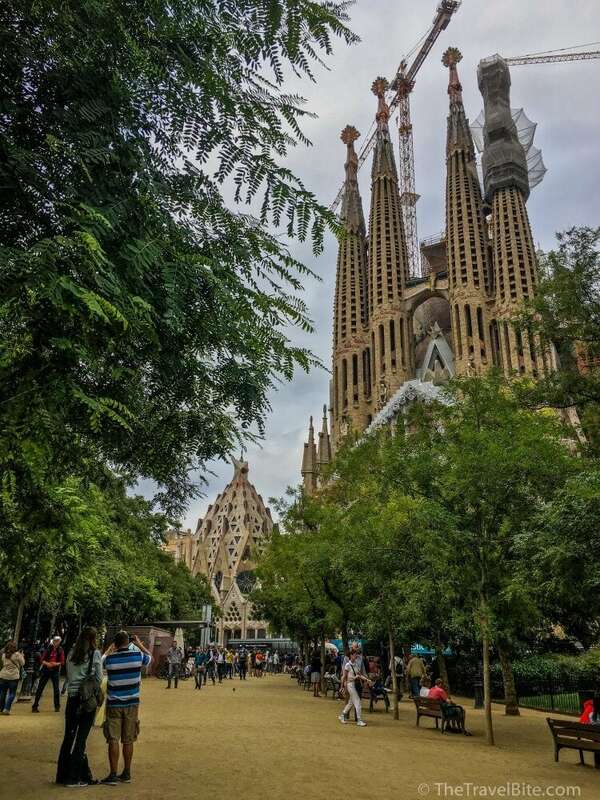 The hotel was in a perfect neighborhood, quiet and close to La Sagrada Familia! Staying overnight in a neighborhood away from the tourist traps has it’s perks, including amazing coffee shops. 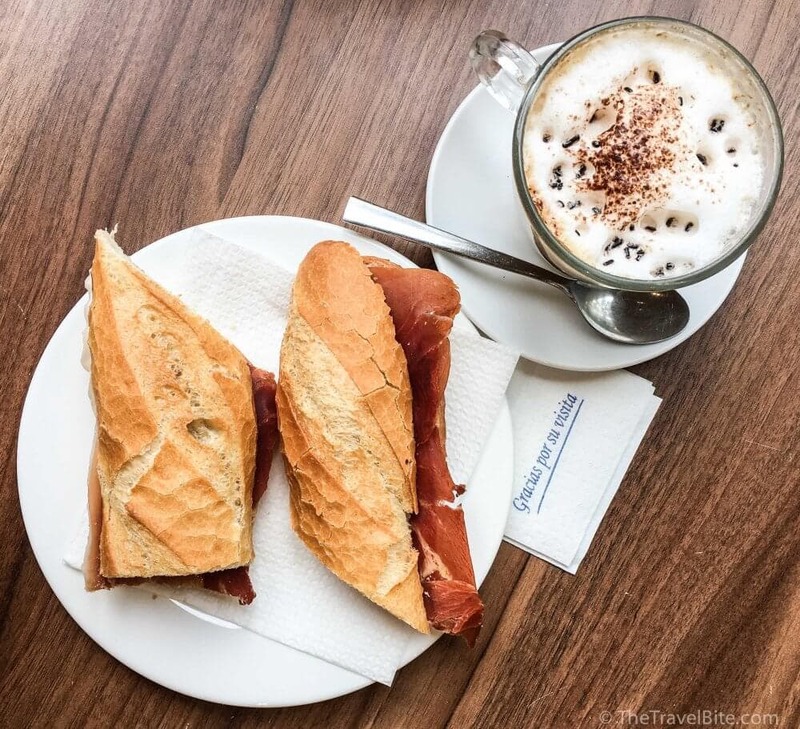 Although, I had to brush off some of my old high school Spanish to place an order for jamón bocadillos (ham sandwiches) and coffee. 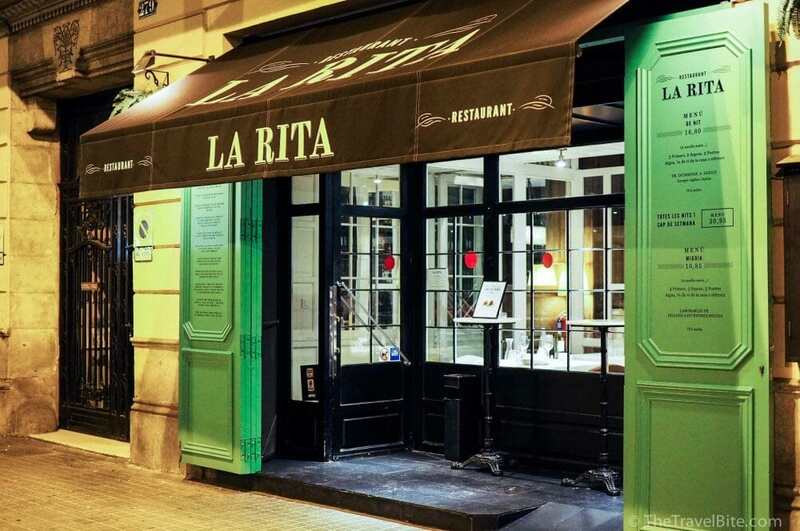 Our first night included a welcome dinner at La Rita, a tapas restaurant walking distance from our hotel. It was a FEAST! 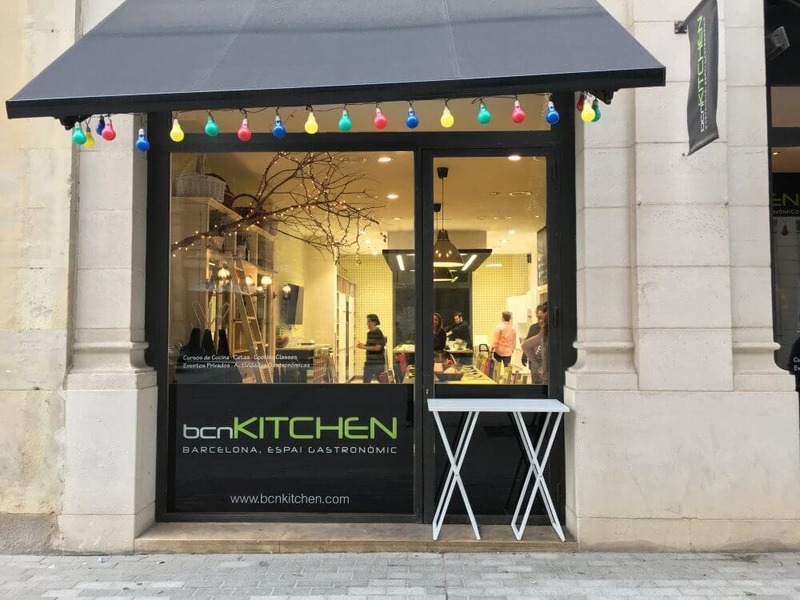 The next morning, after fueling up on coffee at the hotel, we had a cooking class at BCN Kitchen. What a way to kick off a food and wine tour of Spain! We started out by visiting Santa Caterina Market with the chef, learning about all the regional meats, cheeses, and vegetables. Then, we headed back to the kitchen with provisions picked up at the marked and learned how to make Spanish Potato Tortillas, Paella, and Crema Catalan. 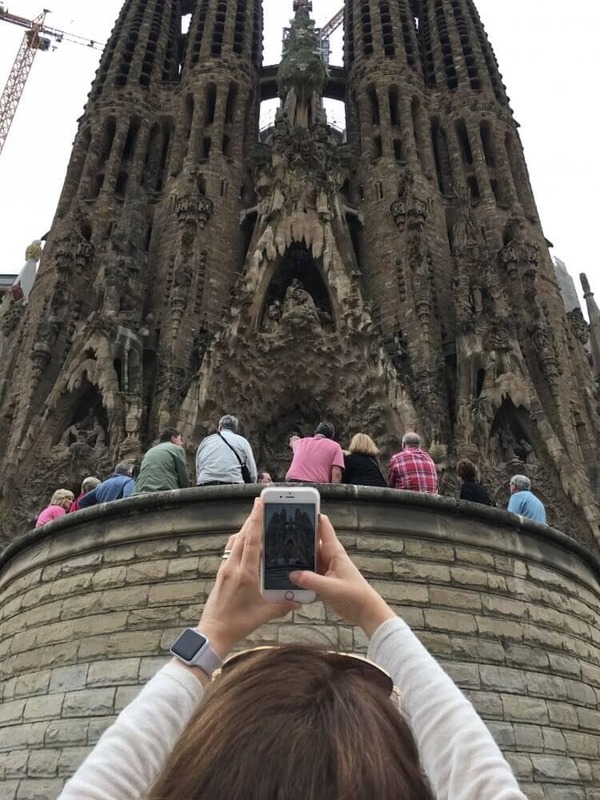 Afterwards we had a quick tour of the city including a visit to La Sagrada Familia. After walking by the outside on our own during our first day, we were delighted to see inside, especially with a guide. 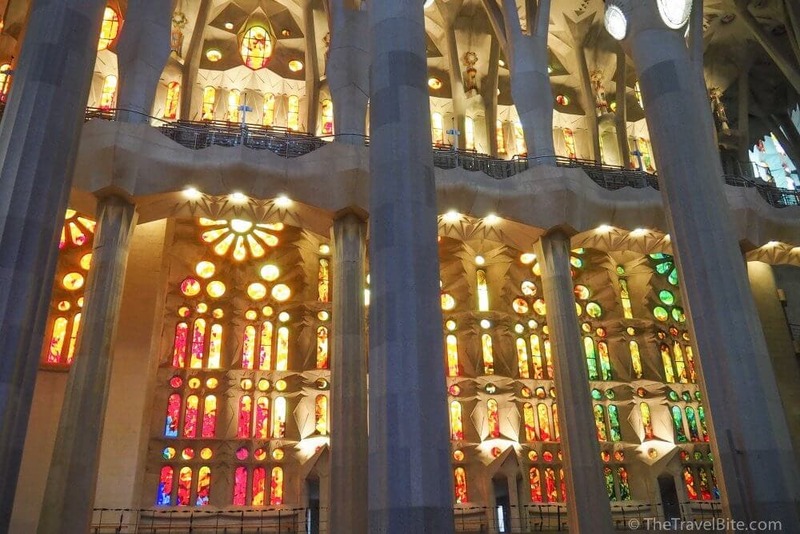 It was a breathtaking forest of stone bathed in colorful light from the stained glass windows. That evening we had some free time to explore on our own, so we went for a walk and met some friends for tapas outside of Gran Teatre del Liceu, which I highly recommend taking a peek at because the architecture is stunning! Viaje! The next day we began our road trip up to San Sebastian with a couple of delicious stops along the way. The first, a visit to Parés Baltà, a Cava winery for a tasting. Cava is Spanish bubbly and is produced with the same method as Champagne. 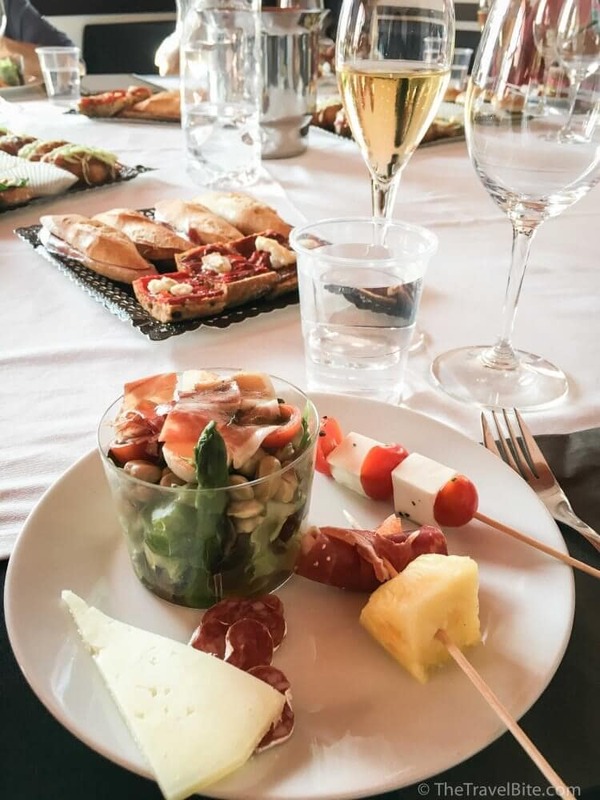 We got to go in their Cava cave where the sparkling wines were resting in the riddling racks, and then noshed on a huge spread of tapas paired with the producer’s wines. 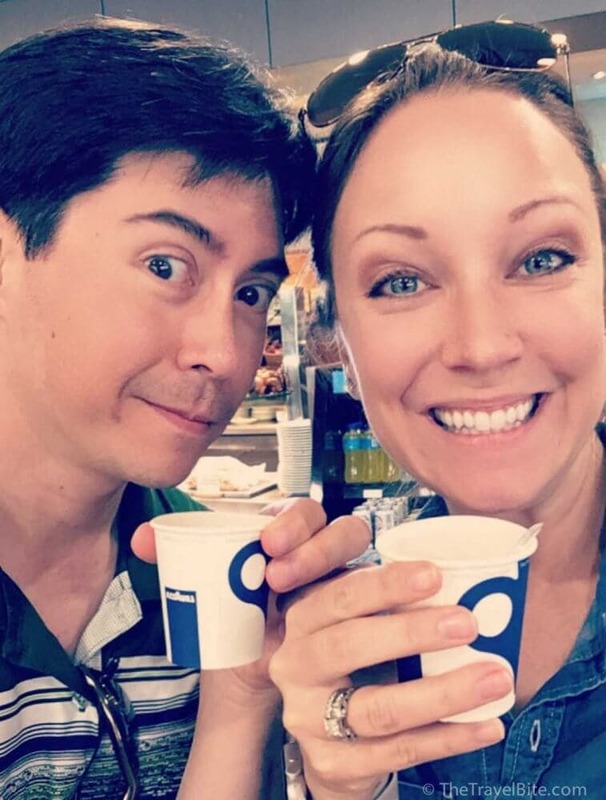 Now, I realize that in a post about a grand tour of food my next comment might seem silly, but one of the things I love about Europe is their gas station rest stops. Seriously! 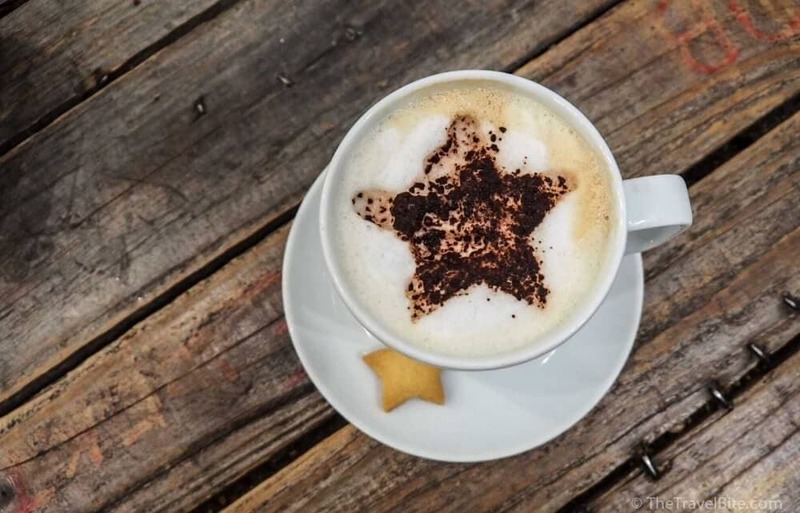 We just don’t get freshly prepared foods and real barista-made cappuccinos and espressos at rest stops in the United States. Just something to appreciate while you’re there. Since we were arriving in San Sebastian at dinner time, our wonderful guide, Emilio, made a suggestion of stopping at Petritegi, one of the Basque region cider houses (a “Sagardotegi”) for dinner. This was a bit of a spontaneous adventure since it wasn’t on our itinerary, so Emilio called ahead for dinner prices and asked the group if we’d be interested. It was unanimous — YES! Now, this was definitely an immersive and rustic foodie experience. The cider is poured out of large barrels with a single spout, so you have to sort of catch it with your glass. Dinner was served family style and included traditional Basque fare including cod omelettes, cod with onions, steak, and quince jellies for dessert. I loved dinner! The cider, not so much. It was kind of funky. LOL! 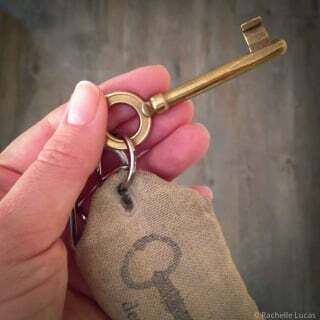 But that’s just a matter of personal taste. 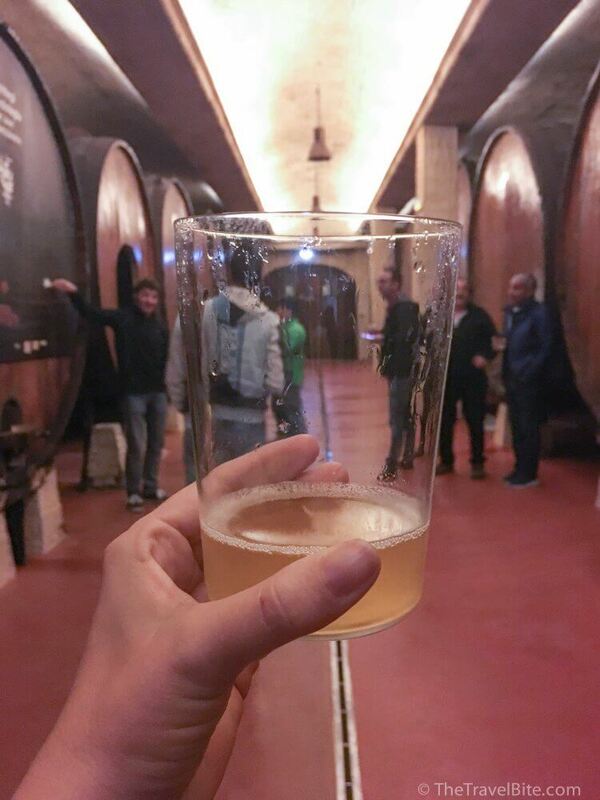 The Basque style cider is a bit more like sour beer, so if you’re a fan of sour beer, you’ll love it! 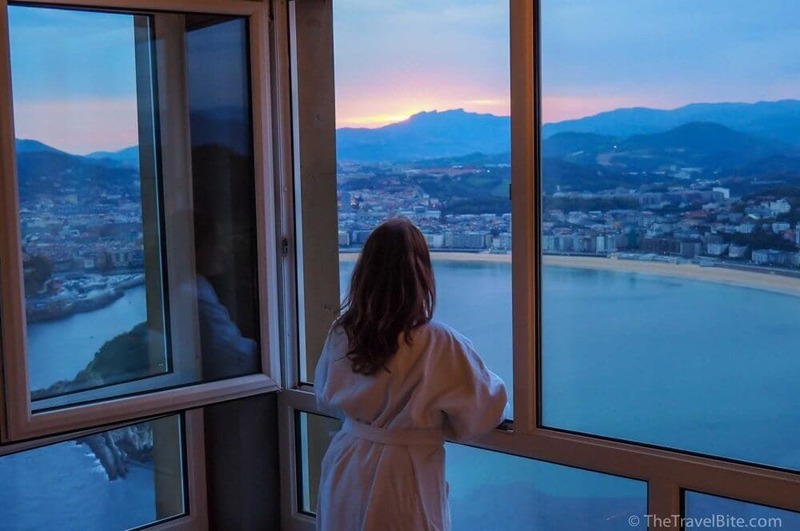 We woke up the next morning to the most glorious view of San Sebastian. Truly, if I could make time stand still, it would have been this moment. But, alas, the sun rose and there was some sightseeing to do. 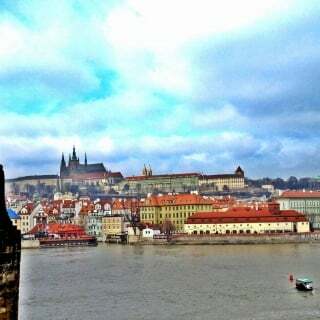 We started the morning with a guided tour of old town and then had the rest of the day to explore the city on our own. 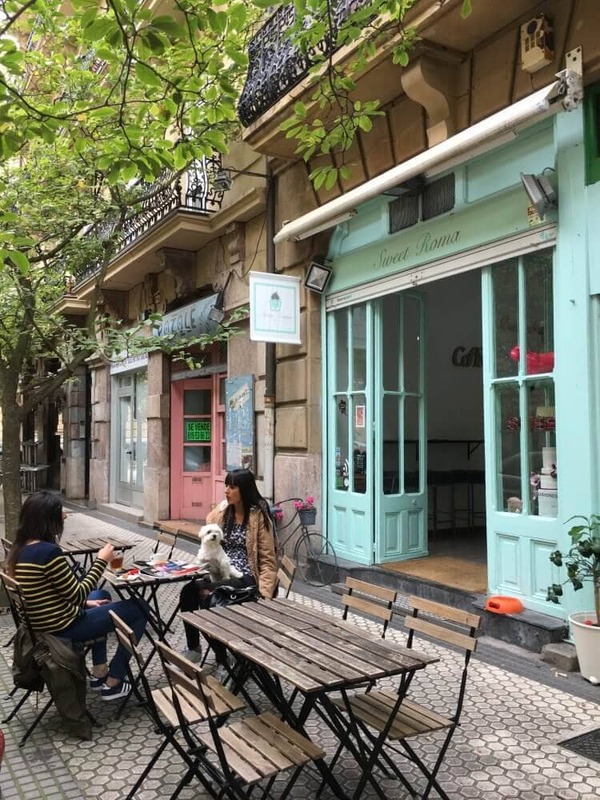 We walked along the porticoes at the beach, investigated a few pintxo bars (similar to tapas, but Basque style), and even found a few quaint coffee shops. The pinxtos are a bit different than tapas in that they’re already prepared and served buffet style. They’re essentially really good bar food, but since the region is coastal, a lot of them had shrimp on them so Pete (being that he’s allergic and all) couldn’t partake. So, since it was a bit of a rainy day, we indulged in too many hot coffees and pastries. The bakeries were definitely a happy surprise! 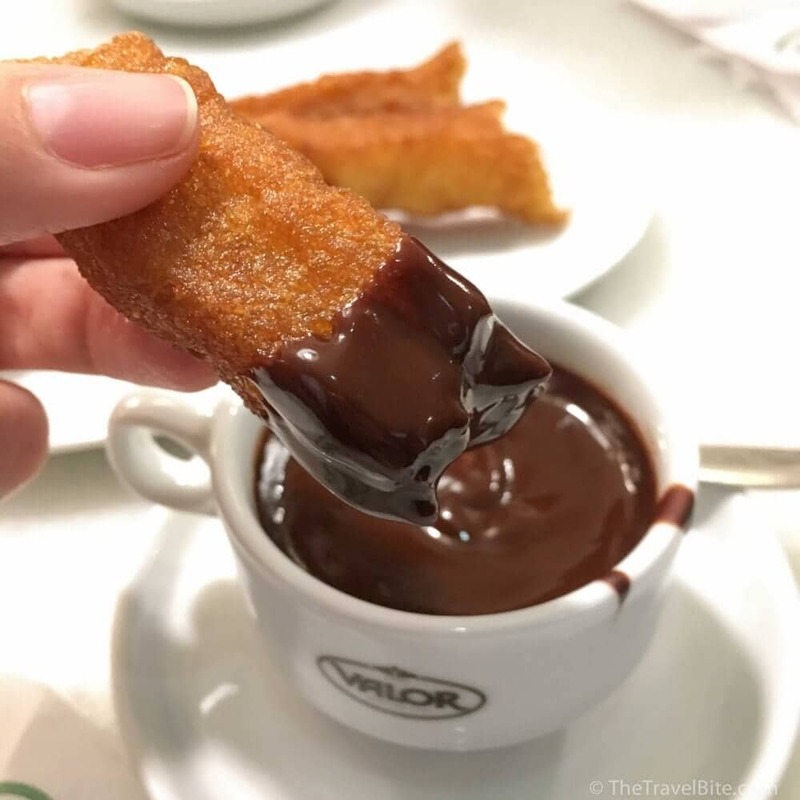 Churros con chocolate – breakfast of champions! 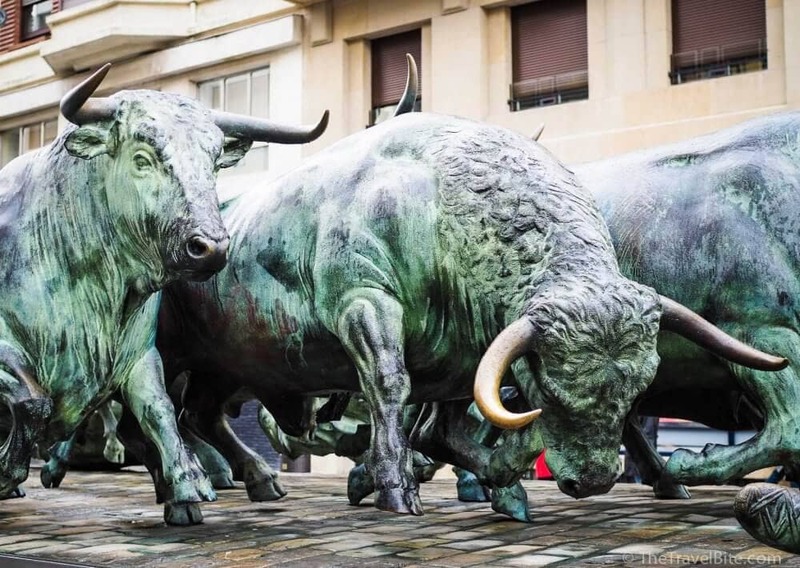 We left San Sebastian to make our way down to the Rioja region, stopping in Pamplona for a half day excursion. And any day that starts with churros and chocolate is a great day. I think originally we were supposed to have churros in Madrid, but I’m so glad our guide, Emilio, had this place in Pamplona picked out. After we were fully caffeinated and on a chocolate high, we walked through the small town of Pamplona, known for the running of the bulls! We walked the same streets, thankfully calm and quiet without any real live bulls. But we did find tons of art for some photography fun. And I confess, yes, we did purchase some red scarves as souvenirs. 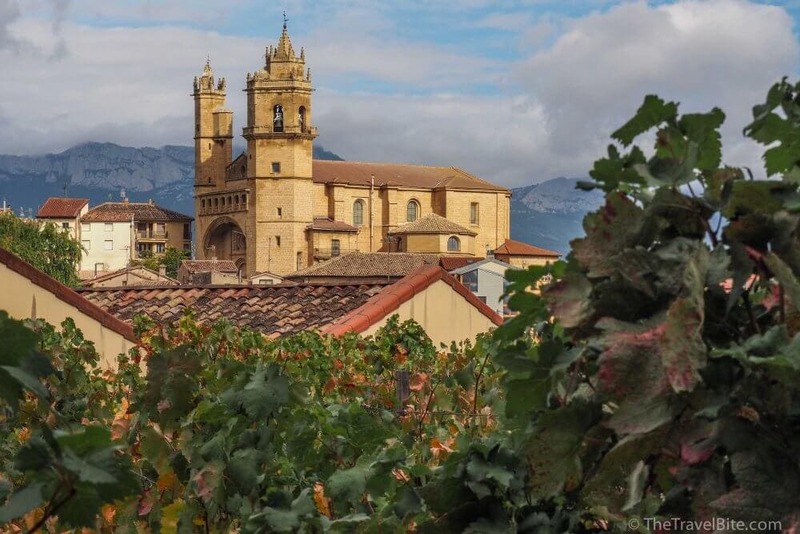 From Pamplona, we headed to Longrono, the capital of the province of La Rioja. 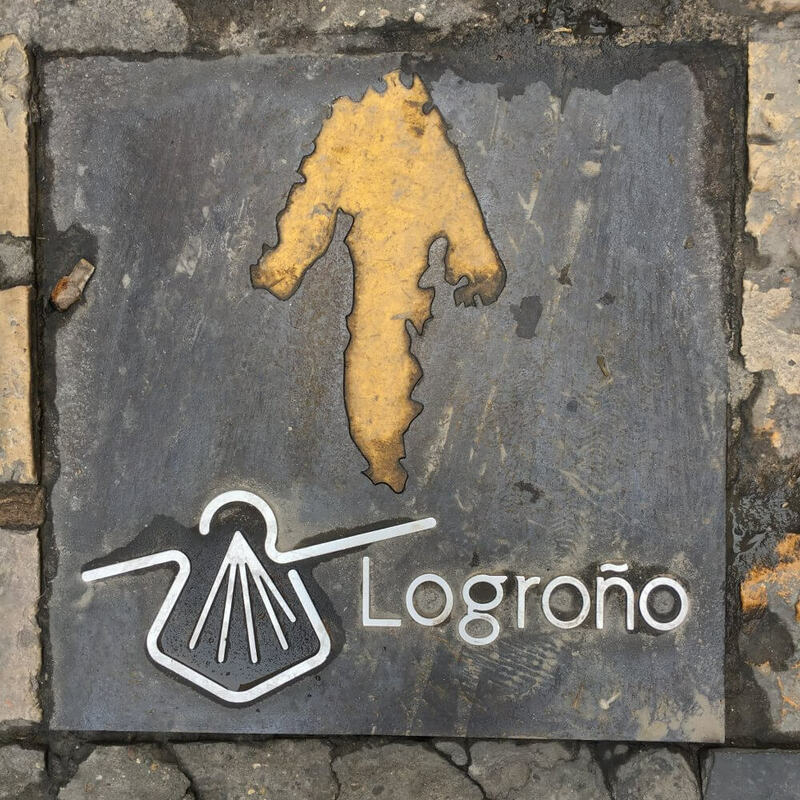 The Camino de Santiago pilgramage walk goes right through Longrono, so we had a bit of fun walking around town to find parts of the trail. And after a long walk, we worked up enough appetite for a big steak dinner and some red wine! 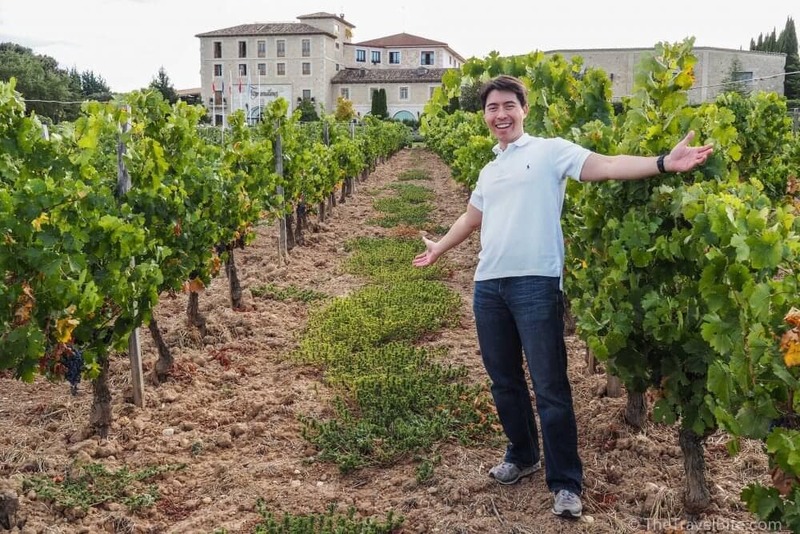 I’ve been to a couple of wine museums, and nothing compares to what we experienced at the Vivanco Wine Museum. 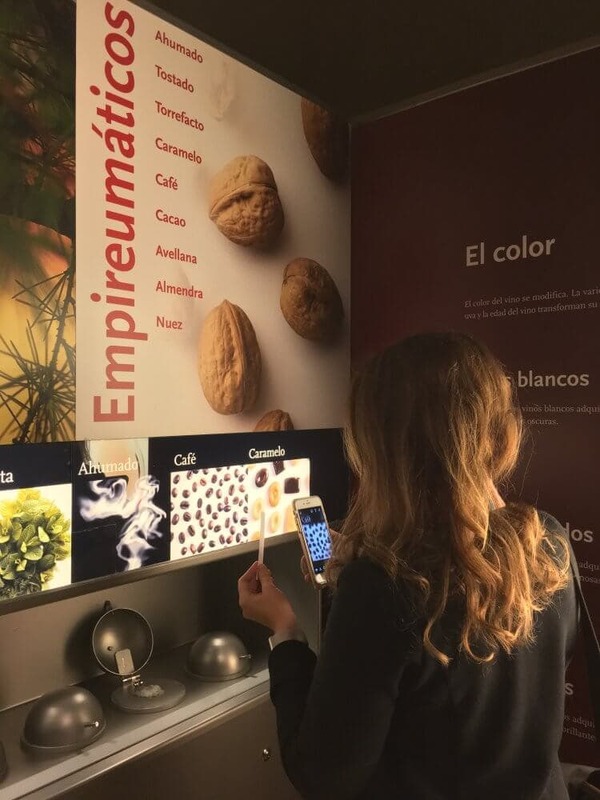 We spent our first morning in the Rioja region in Briones (just a short drive from Longrono) to visit Vivanco, a museum of wine culture and history. It was the most comprehensive collection I’ve ever seen of wine artifacts, ancient presses, and even an eclectic selection of cork screws! After working up a thirst for wine at the museum, we went for a tasting at Marqués de Riscal. 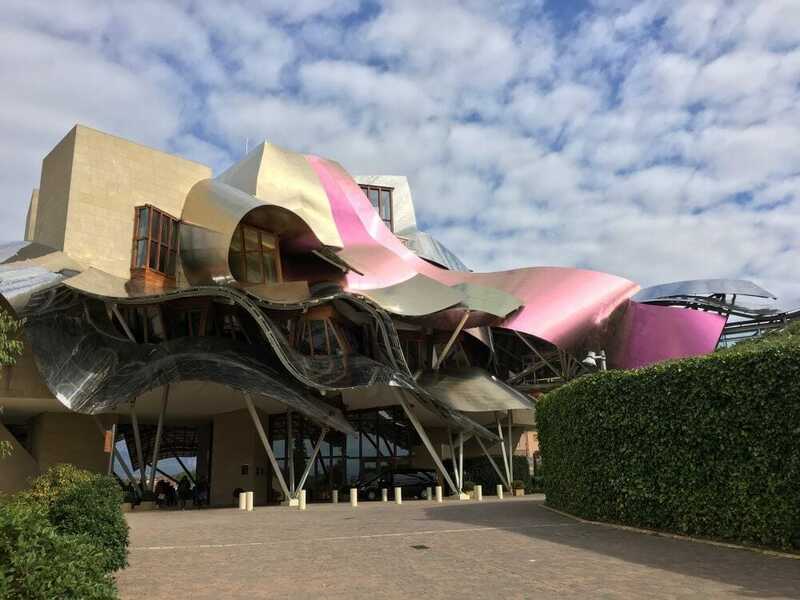 They’ve been producing Rioja here since the 17th century and their historic cellar was impressive to see, especially alongside the contrasting modern hotel designed by Guggenheim architect Frank O. Gehry. 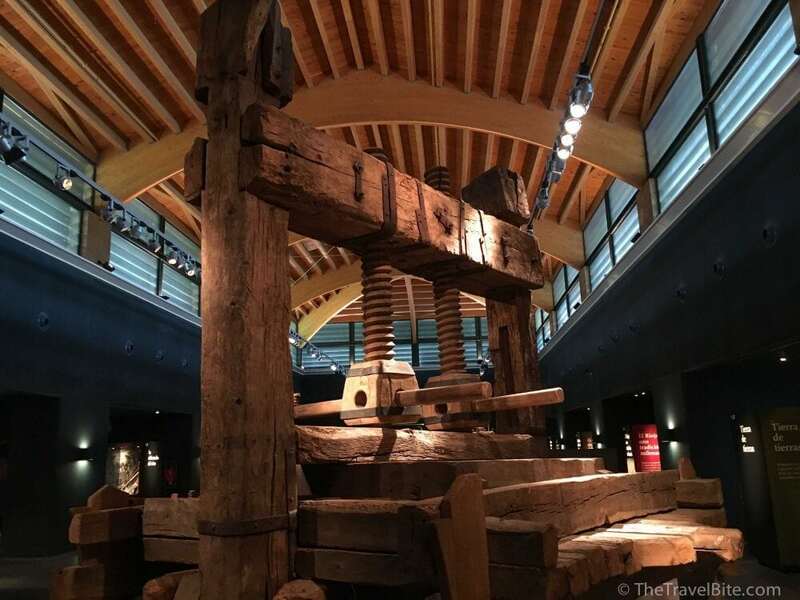 Tours are always perfect for discovering new places you want to come back to and spend more time, and the Marqués de Riscal hotel and winery is definitely a place I’d like to return to. Making our way to Madrid from Rioja, we traveled to Aranda de Duero and attended one of the most unique wine tastings I’ve experienced. 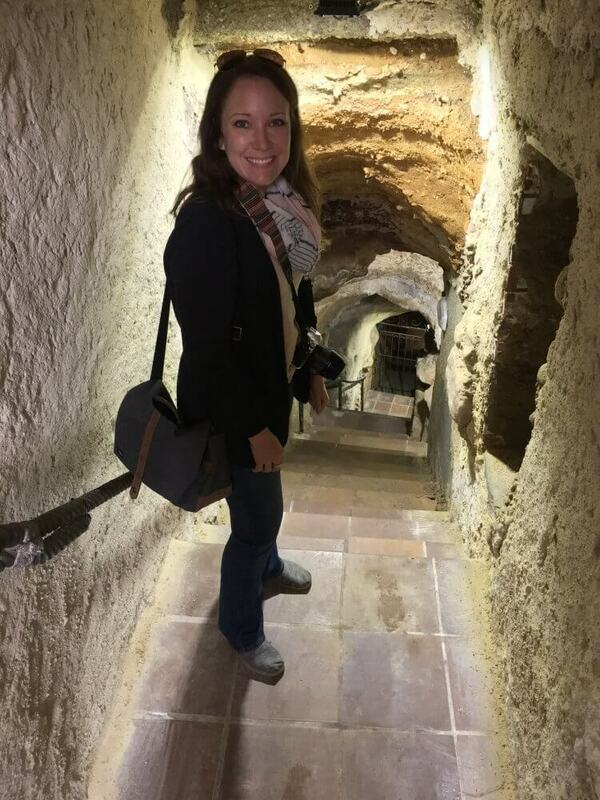 After walking through the village, we descended deep into an underground wine cave that’s part of a labyrinth of cellars underneath the city that were built in the 12th century to store food and wine. After our tasting, we went back upstairs to the main town square to find some lunch. 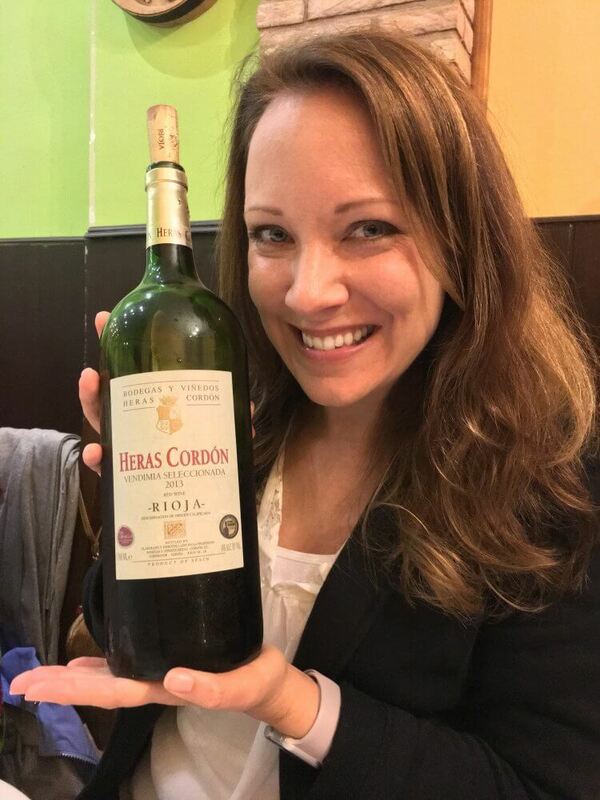 We happened to be visiting in October, which is why our lunch here looks German — Aranda de Duero was celebrating Octoberfest! 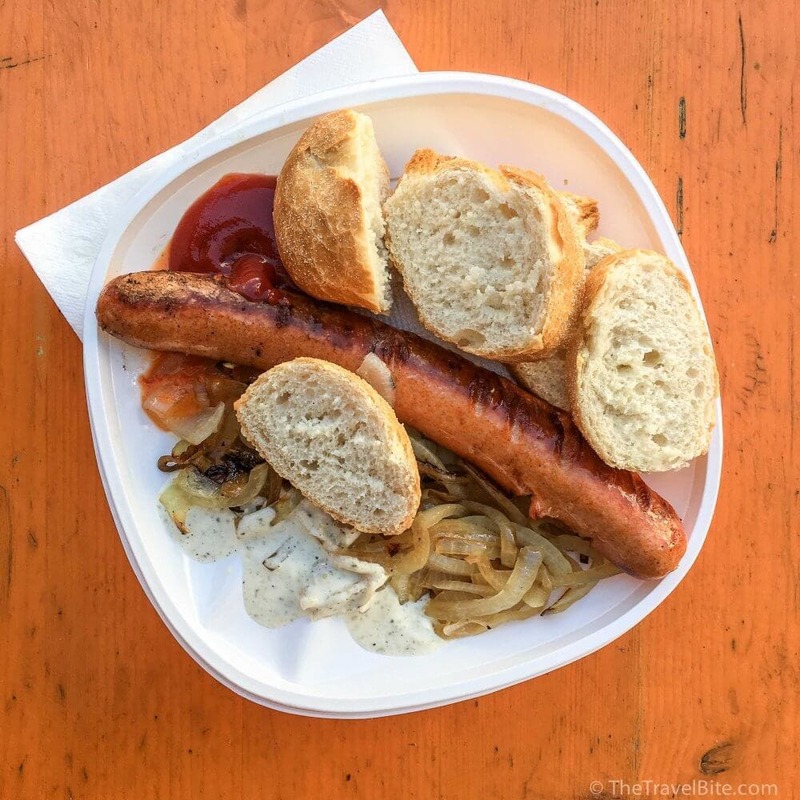 It’s always fun to travel during different parts of the year and experience fun surprises each season, including German bratwurst and beer while in Spain! Our final night in the wine lands of Spain was spent at the vineyard and winery of Torremilanos. We met with the owner to go for a sunset walk in the vineyard and tour her cooperage before dinner. As we followed her up ladders to better see the wine tanks, and then walked through the cooperage where they make their own barrels, I described her as “one tough cookie” as a compliment, but apparently that American phrase doesn’t directly translate to Spanish so it got quite a few laughs. Our final two days of the tour were spent in the city of Madrid! After all the indulgent food, Pete and I put on our walking shoes and logged at least five miles on our pedometer checking out Buen Retiro Park and the beautiful architecture throughout the city. 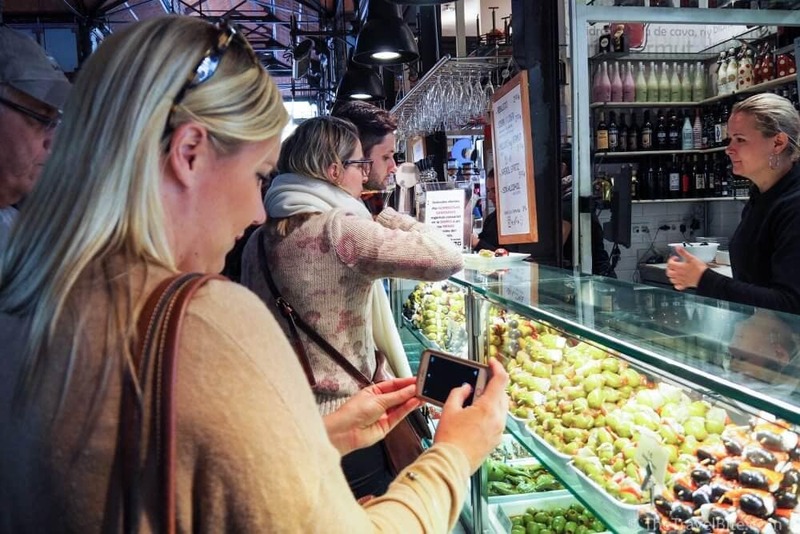 Of course, we couldn’t stay away from Mercado de San Miguel , a well known destination for food enthusiasts. 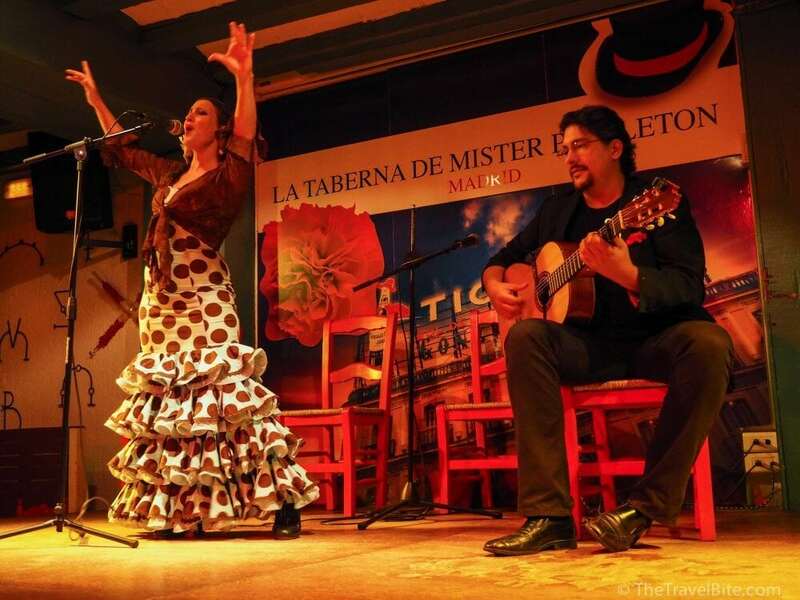 I think the highlight of our entire trip was going back to Mercado de San Miguel at night for a glass of wine, and then walking over to La Taberna de Mister Pinkleton in the for tapas and a flamenco show. I thought it might be touristy, you know, with loads of people. Instead it was small, intimate, with tiny tables tucked around the stage, wine flowing freely, and a parade of tapas on our plates while we listened to beautiful accoustic music and were mesmorized by dancers on the stage right in front of us. 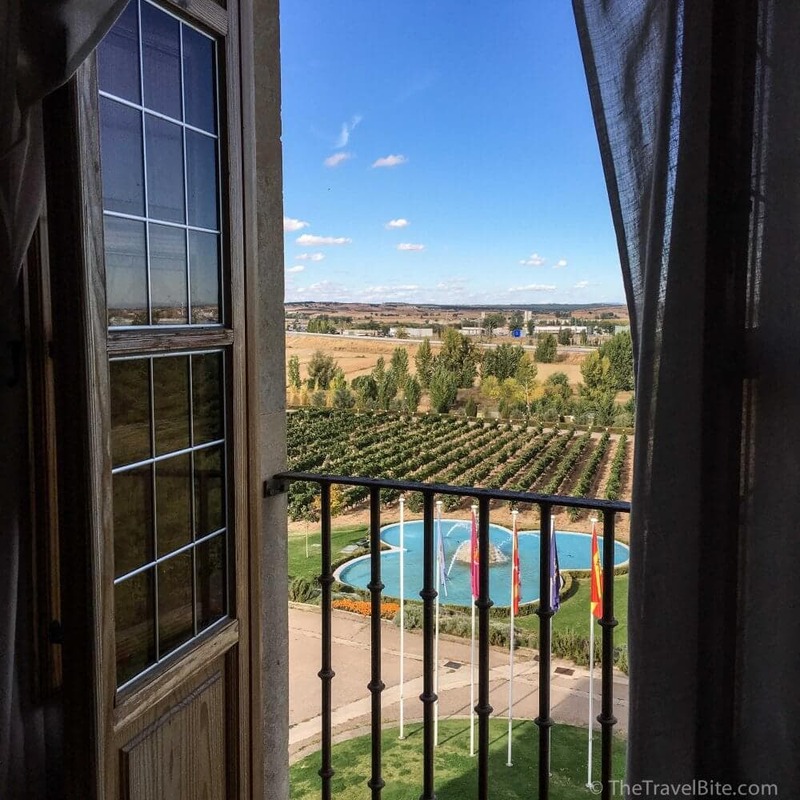 Check out more pictures of Spain in our photo gallery post! You guys are soooo cute! Can’t wait to catch up (I hope!) in Orlando next month. Yes! Let us know when! Sounds like an amazing experience! One I would love to definitely try one day – thanks for sharing! 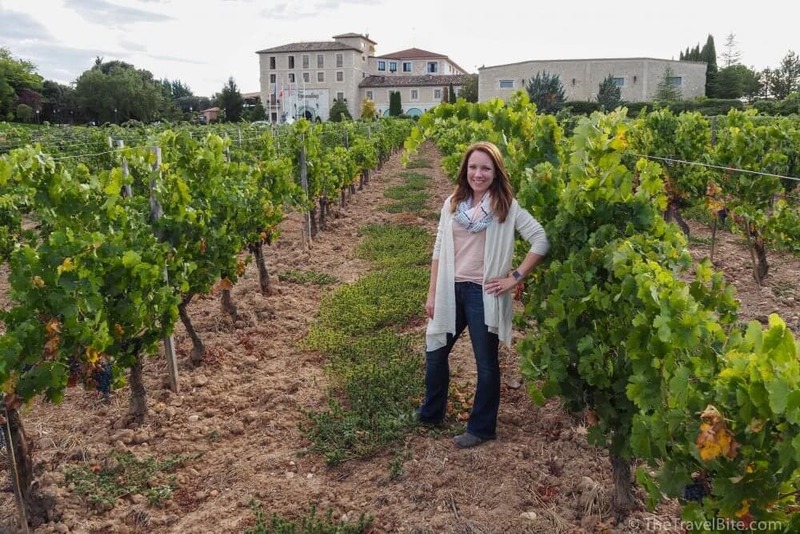 Spain is my all-time favorite foodie destination – and I haven’t scratched the surface yet. 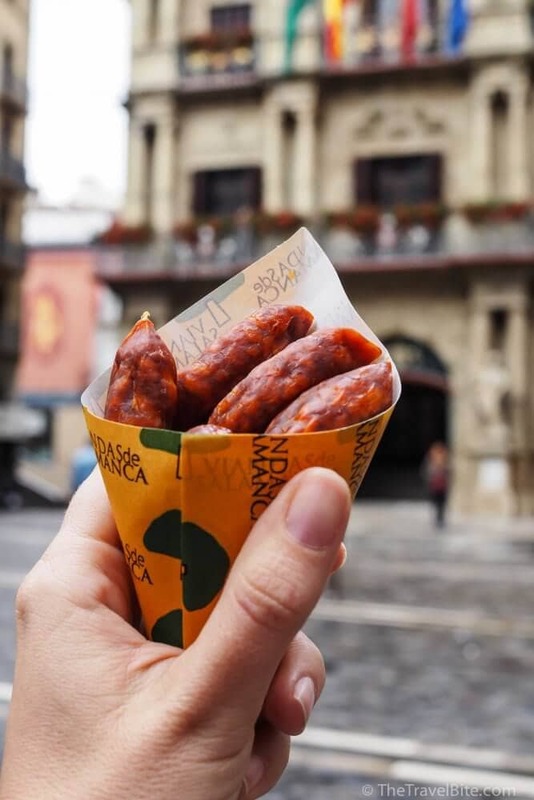 I was lucky to get to Bilbao twice so I was able to taste some of that fabulous Basque cuisine and the pintxos, but I need to get to San Sebastian, which I hear has the best food in Spain. 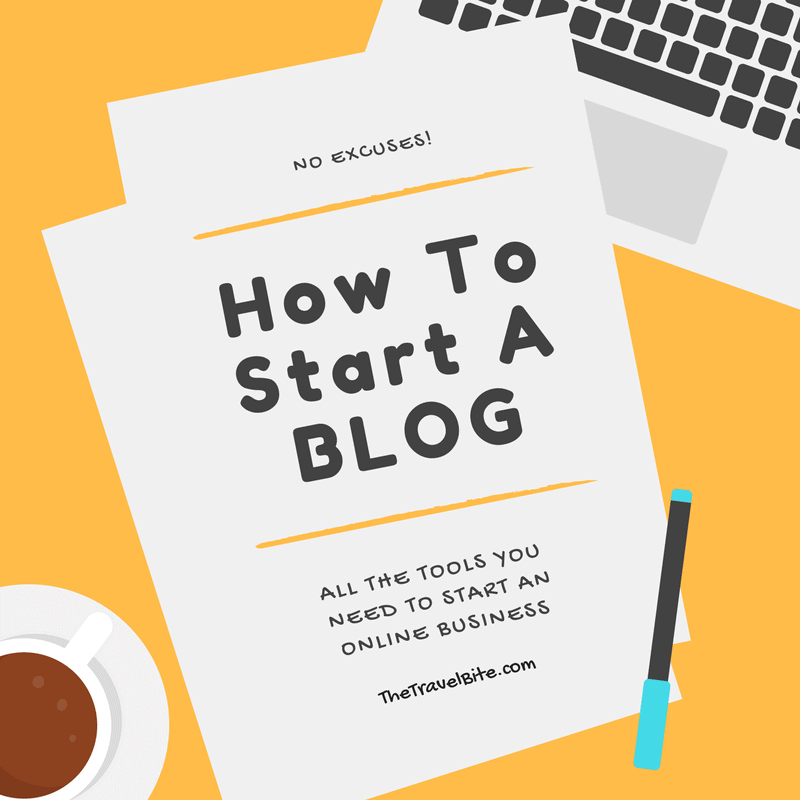 Also, you should have a warning at the start of this post – Do Not Read When Hungry! !